What will this case mean for federal lands in the West? Like many of you, I am still scratching my head over the surprising news last week that Ammon Bundy, Ryan Bundy, and five others were acquitted of all charges stemming from their occupation of the Malheur National Wildlife Refuge in January and early February of this year. When the case started last month, it seemed like a foregone conclusion that the jury would find them guilty. They freely acknowledged that they had occupied buildings at the wildlife refuge and that they had brought firearms to ensure that federal law enforcement officials couldn’t easily arrest them; and the prosecution had a solid wall of evidence, including extensive posts that the defendants had made on social media. So how could the jury have returned a “not guilty” verdict in this case, and more importantly, what implications will this verdict have for federal lands in the West? There are at least two ways to explain the verdict, and perhaps additional information from jurors will suggest other possibilities. One explanation is that the jury in fact believed that the defendants were guilty but chose to acquit them anyway. Perhaps Ammon Bundy’s impassioned testimony was so moving that the jury decided that the law should not apply to him. Cases like this, referred to as jury nullification, happen, but they are rare; and at this point, there simply isn’t any solid evidence to support this explanation. Indeed, the first juror to speak to the press on Friday night explained that a verdict of “not guilty” was not the same thing as declaring the defendants innocent. Without evidence of jury nullification, it seems more likely that the verdict stems from the specific charges federal prosecutors selected for trial. Presumably, if the defendants were on trial for all of their actions (trespassing, destruction of government property, disruption of federal land management, etc.) the jury would have found them guilty of at least some charges. After all, the defendants admitted that they were engaged in an act of civil disobedience, defying federal authority in order to draw attention to some larger injustice. But the federal government chose to prosecute the defendants primarily for two specific violations. The federal indictment charges that the seven defendants conspired “to prevent by force, intimidation, and threats, officers and employees of the United States Fish and Wildlife Service and the Bureau of Land Management . . . from discharging the duties of their office at the Malheur National Wildlife Refuge,” and that they “did knowingly possess . . . a firearm or dangerous weapon in a federal facility . . . with the intent that the firearm or dangerous weapon be used in the commission of a crime.” The jury could have been convinced that the defendants had engaged in illegal activities but that they had not conspired to do so according to the terms that the prosecution outlined. And if the defendants had not conspired to impede federal employees, while clearly impeding them, then they could not be found guilty of possessing firearms for the purpose of advancing a criminal conspiracy. A loaded analogy would be a case in which a defendant is found not guilty of 1st degree murder, despite having murdered someone, because the prosecution could not convince the jury that the crime had been premeditated. Several defendants, it should be noted, faced additional charges, and the jury verdicts in for these is even harder to understand. For example, Kenneth Medenbach was arrested after he took a government vehicle from the refuge, clearly without authorization, and his primary defense was that he was just borrowing it and intended to return it. How the jury acquitted him of a theft charge is difficult to imagine, but perhaps more information if jurors come forward till make this clear. With the verdict delivered, though, the more important question becomes what this case will mean for federal lands in the West. A number of states, such as Utah, have passed legislation challenging the federal governments’ authority to own vast tracks of land and demanding that those lands be turned over to the states. Utah even has millions of dollars in the state budget to litigate federal land ownership. While I don’t believe Utah has any legal claim, the state is at least using constitutionally established means of challenging federal authority. The Malheur occupation reflects this same resentment of federal land management, in this case expressed through direct and potentially violent rebellion. Ammon and Ryan Bundy remain in prison because they will be tried in Nevada on conspiracy charges stemming from an armed confrontation with Bureau of Land Management officials in 2014. Some of you may remember the video of Ammon Bundy being tasered by BLM officers after he kicked a police K-9 and the pictures of armed Bundy supporters pointing weapons at federal officers. One possibility of last week’s verdict, of course, is that it will embolden others to choose armed confrontation with federal land management employees rather than the constitutionally protected path of legal challenge that Utah is pursuing, and that poses a clear and present danger to the rule of law in the American West. A growing number of people taking up arms, supported in some cases by sitting elected officials, could hold federal lands hostage, and this is exactly what Ammon Bundy was trying to do. As he explained in his trial: “Without the guns, they would have come out in a paddy wagon and put us in zip-tie handcuffs. We would never have been able to tell people why we were there.” In other words, he said, the threat of bloodshed at the Malheur Refuge allowed the protesters to hold these federal lands hostage long enough to make their political statement. This is particularly troubling when compared to the ongoing conflict in North Dakota over the Dakota Access Pipeline. There, protesters occupied private land being used for the pipeline, which they argue could desecrate Native American burial sites and contaminate drinking water. These protesters were also engaged in acts of civil disobedience that violated various laws. They trespassed on private land; they blocked a highway with burning vehicles; etc. They were not generally armed, however, and they did not promise to defend themselves with weapons if the police tried to remove them. What happened? State police, county police, the North Dakota National Guard, and a private security team physically removed them from the land and arrested more than 140 protesters. As with any story, there are complexities beneath this quick summary, but one could still draw a disturbing and dangerous lesson from it: come armed, and you will have time to plead your case and possibly escape punishment; come unarmed, and you will be removed by overwhelming force. While I am thinking primarily of federal lands management, this potential lesson has implications in other contexts as well, particularly the current presidential election, where Donald Trump has called the election rigged, and a number of his supporters have threatened civil unrest if Hillary Clinton is elected president. The Oregon verdict won’t make people take up arms if Ms. Clinton is elected, but it certainly gives them reason to hope that they too might be acquitted if they decide to take over federal buildings in protest. Looking ahead to 2050, it is clear that federal lands will remain controversial in the West. As geography John Wright argues, land tenure is “the spatial musculature of the American West,” and people there “do not believe in map colors.” And disagreement and controversy is not itself a problem; indeed, a good disagreement can be a real moral achievement. The hope, then, is that we can disagree over federal lands in the west in ways that reflect the virtues on which a healthy democracy rests rather than resorting to weapons, threats of violence, and brute force. Hopefully the justice system will send a clear message to this effect in the Bundys’ upcoming trial in Nevada. Terrorism. More specifically, the geographical dimensions of terrorism remains a dominate thread in my research agenda. My primary interests are the protection of people and place from politically motivated violence. My PhD dissertation investigated these ideas more formally through my work, Geovisualizing terror: the geography of terrorism threat in the United States. Since my PhD work, I have continued to publish in this area, such as my work with Nathan Mosurinjohn on 3D visualization of sniper threat from a VIP crowded event in Urban 3D GIS Modeling of Terrorism Sniper Hazards. I have published a Kurdish Conflict Database and currently have been working on a paper dealing with Spanish domestic terrorism with a co-author. I also have been deeply embedded in food. Starting with Food Inc. many years ago, I have been profoundly changed in my attitudes and actions related to food. I’ve become a believer in healthy eating. My family and I have dramatically shifted our resources to focus on local, organic food. I am invested in local Community Supported Agriculture (CSA), the local co-op of farm-to-table connections, farm-to-door organic delivery, Community Supported Fisheries (CSF) from Alaska, a winter CSA, canning and freezing vegetables and fruits, beekeeping, eating in-season, and my own gardening. I no longer drink soda-pop, I try to drink a ton of water each day, and I try to maximize the variation of colors at each meal in my food. I can say that over the last 3 years, I have felt better than any time in my whole life. Except for regular check-ups, it is amazing that my family members haven’t been to the doctor since we changed our eating food consumption habits. Has it been difficult? Yes, it has. It has been tough eating new things that were foreign tasting. Some stuff just doesn’t work for me – but I still keep trying because of documented nutrition benefits. Eating in season sometimes gets pretty boring. Also, it has been enormously expensive. Organic whole-food purchases are not cheap and the largest portion of my monthly budget goes to food after my mortgage. You know what else is a no-brainer? A call to the population of the United States of America to get healthy. The statistics are staggering and by year 2050, they will be even more dramatic – health is a national security issue in the United States of America. Right now, according to the Center for Disease Control (CDC), the percent of adults in the USA, age 20 years and over with overweight, including obesity is 70.7% (2013-2014). Seven out of ten adults in the United States is overweight. That is staggering. What will be health costs for this aging population? The trend is not good. Furthermore, what will be the costs in money for health care for these folks? Skyrocketing premiums. What about children – our innocent children? The CDC estimates that the percent of adolescents age 12-19 years with obesity is 20.6% (2013-2014). One in five adolescents in the USA is obese. The number is almost the same for even younger where the CDC estimates that the percent of children age 6-11 years old with obesity is 17.4% (2013-2014). Staggering. American’s idolize that there is a pill for every ill. Granted drugs can help and for some, it is necessary. I have nothing against pharmaceutical companies, but they are finding their consumer sheep at a very young age with life-time investments in the digestion of their drugs to compensate for the larger problem – lack of healthy eating. Do you want to feel amazing in health? Stop investing in processed food. Don’t buy it. Can you afford it at first? Probably not, if you were like me. But I started with baby steps and so can you. Start with what you can and pay attention to the benefits to your body. The bowel problems will go away. The skin problems will begin to clear. The weight challenges will be thwarted. The blood pressure will lower. And you might even dispense without the drugs. Do all of this with some moderate exercise and you will feel amazing. What if we don’t – what will be the implications by 2050 of a continued downgrading of healthy American’s? Our national security. Yes, our national security. How will we defend a nation if our population is fat, sick and unhealthy? How will we pay for the defense of our nation if our money is allocated to drugs, hospitals and the health care industry? How will we grow in the development of our minds if our bodies are compromised by drugs? According to the United States data released by the Pentagon, 75 percent of young people ages 17 to 24 are currently unable to enlist in the United States military because of education, obesity, and criminal activity. Staggering. How will that percentage of “unable to enlist” increase if we can’t get a handle on our nutrition? It is time to initiate a serious call to invest in the local food systems around you for your own health – You can take charge of it. Buy from farmers, or entrepreneurs build farmers-market-come-to-you like the West Michigan Co-op does (order through the web directly from the farmer’s co-op | meet two weeks later to get your orders filled in one location), or build a community garden, and all for all of us take baby steps toward whole foods, and if able organic, by reorienting your budget toward good food not food-like products. In addition, let’s start exercising. But don’t just exercise and ignore what you put in your mouth. If you exercise but deny your body the healthy development it needs through good food, what is the use? I love things like the National Football League Play60 movement. But without healthy food intake, it is only half of the solution. If we don’t take healthy food seriously, the implications are clear. There will be only a few healthy enough to defend the United States of America internationally with military and domestically with local law enforcement. Support for this Blog Theme comes with additional funding from the Calvin Center for Christian Scholarship (CCCS) and Calvin College. Geopolitics – Who’s on top? The Arctic Ocean is in a state of thaw. If all things hold true with current trajectories, the ice melt in the Arctic Ocean by 2050 will have redesigned the geopolitical landscape of the North Pole. New shipping routes, fish harvesting, and precious mineral resources of oil and natural gas will be exposed for extraction. But who is in control of this space and who has the rights to this precious place? It may be that ice melt will redesign geopolitics. Or perhaps, geopolitical struggles will be solved before we see seasonal passage in the Arctic waters by 2050. We don’t really know. There are five countries that have shores on the Arctic Ocean and eight that are geographically situated in the Arctic Circle. The Arctic circle is drawn at about 66.5 degrees’ North latitude. The countries with shores are the United States (Alaska), Canada, Denmark (Greenland), Norway, and Russia. The other three in the Arctic circle are Iceland, Sweden and Finland. All eight of these countries constitute the Arctic Council, which is a forum for discussion of Arctic issues and include representation of indigenous peoples rights. In Geography 110 – World Regions, I instruct students on the internationally recognized EEZ’s, the Exclusive Economic Zones, which stipulate a 200 nautical mile distance from countries into the oceans, as their exclusive waters and seabed – countries decide in this zone what is allowed regarding extraction of resources. In this zone, the first 12 nautical miles from the shore are considered territorial waters and international law in UNCLOS (United Nations Convention on the Law of the Sea) stipulates that another country may innocently pass in these waters if they are expedient and their passage is conducted in a non-provoking manner. When the EEZ distance is shortened because of the proximity of another state, then the EEZ is split between them or all involved. Beyond these zones are International Waters. These somewhat unregulated waters still have some protection in the seabed below, beyond the EEZ, which are regulated by the United Nations. The North Pole currently resides in International Waters. The future holds uncertainty of this position. Because of consistent ice cover in the Arctic Ocean, the EEZ’s in this region have typically been restricted geographically. The ice restriction limits navigation of seaworthy vessels and that has caused numerous claims and challenges for ships wanting passage through the territorial waters. But the real concern is with the ratification of UNCLOS and what that means for an extension of the EEZs. UNCLOS gives provision for the five Arctic shoreline nations to have rights in the Arctic circle. However, there are also provisions which allow any of these five countries to claim additional seabed authority based on continent shelf distances beyond their EEZ boundary by submission under UNCLOS to the Commission on the Limits of the Continental Shelf (CLCS). The rules state that once a country ratifies UNCLOS, they have 10 years in which to make their case to claim the continental shelf sea bed beyond their EEZ boundary. All but the United States have ratified UNCLOS. The rest have laid claim in various forms of the thawing Arctic. Russia was second to ratify UNCLOS in 1997 but first to make a claim for extension of their EEZs. Their 2001 claim was that the Siberian continental shelf in Asia extended well beyond their EEZ and gave them the rights to the seabed, including the North Pole and other areas of the Arctic. They claimed the under-Arctic mountain range, the Lomonosov Ridge, was an extension of the continent shelf from Asia and Europe and gave them the rights to the seabed and all the mineral wealth under it. The UN delayed confirmation for the claims based on the need for further research. Norway was first to ratify UNCLOS in 1996 but second to make a claim. In 1996, there was only little concern for ice melt and a limited collection of data dissemination in the international community on climate change and its effect on thaw at the poles. Al Gore’s documentary, An Inconvenient Truth, which internationally promoted issues of climate change was not released until 2006 and it was that same year that Norway had to make a claim (10 years from ratification) and they did so, extending some of their distance beyond the EEZ including appeals in their claim to the UN for the Barents Sea. The series of successful claims processed by the UN led to peaceful results between disputes with Russia over the area in the Barents. Canada was next to ratify UNCLOS in 2003, thus by 2013 they were required to make their claim. With ice melt in the Arctic, they put forth a claim in 2013 to extend their EEZ on the continental shelf that included the North Pole. They discounted the previous claims of Russia for the North Pole. Government officials also indicated Canadian patrol vessels would protect their claims. Greenland is the closest land mass to the defined North Pole and in 2004 Denmark, the country that administers Greenland as an autonomous country, had until 2014 to make a claim. They did so at the end of 2014, claiming the North Pole and even beyond to the Asian continental shelf on the edge of the Russian EEZ border. Denmark has claimed the Lomonosov Ridge as its territory. The United States of America has yet to ratify UNCLOS and has no claim of extension in the region. Recently in 2015 and February of 2016, Russia submitted extensive data to UNCLOS, claiming a region of 350 nautical miles beyond their shore, which includes 1.2 million square kilometers of seascape. Although UNCLOS has indicated work on the claims (see the submissions here and the Chair reports here), there yet remains questions about the geopolitical control of the North Pole. Interestingly, UNCLOS may defer to the Ilulissat Declaration. 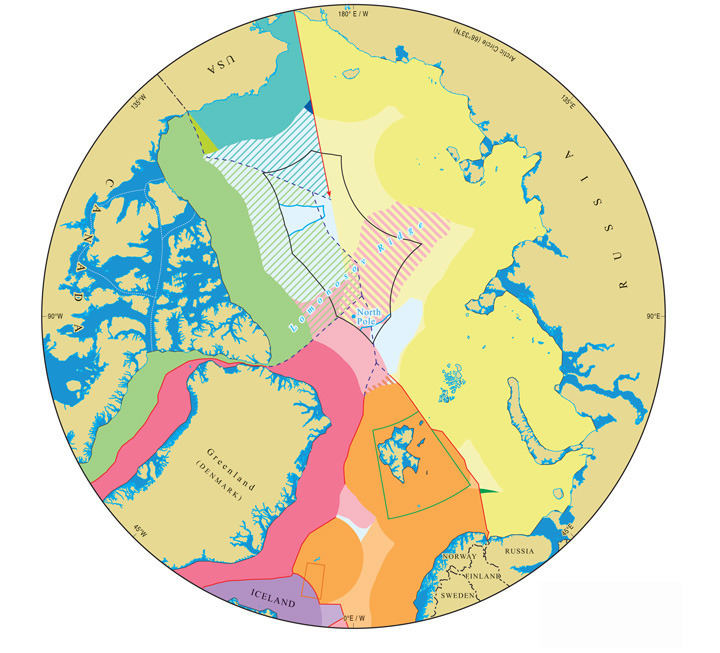 In 2008, the five Arctic shoreline countries met and agreed that moving forward, the countries would follow and agree to international law as relates to the seas. They also agreed that, “We remain committed to this legal framework and to the orderly settlement of any possible overlapping claims.”, thus setting a precedent for international cooperation and agreement as a way forward with de jure claims. If UNCLOS rules in favor of Russia, it may invoke challenge to Ilulissat Declaration since the participants have agreed to be, “committed to this legal framework”. One wonders to what degree the Ilulissat Declaration might be effective. Certainly, it is clear that the Arctic Council was not invited, which includes representation by indigenous peoples. If the Arctic does indeed get carved up, it will be reminiscent of the tragedy of the Berlin Conference in 1884, which divided Africa among the European powers and legitimized colonization, without any representation by the peoples of the African continent. Who will own the North Pole? Who will be committed to its preservation, despite resource extraction. Will the changing ecosystem flora and fauna be able to survive? Will humans create more chaos on the planet already in environmental and political challenge? Will the geopolitical states uphold international law, even with these valuable resources at stake? As we move toward 2050, let us keep an eye on the geopolitics of the Arctic and engage in the conversation. Author geolearnerPosted on October 10, 2016 November 28, 2016 Tags Arctic, Canada, climate, Denmark, GEO2050, Geography, geopolitics, Greenland, North Pole, Norway, Russia, Security, United StatesLeave a comment on Geopolitics – Who’s on top? Entertaining Global Peace with Albanian Besa? What can we learn from the Albanian besa that promotes peace instead of conflict? There I stood in the middle of the small village in the northern mountains of Albania. The year was 1996. It was still a momentous time in the history of the small nation. The Berlin Wall crumbled on November 9th, 1989 and with it, the collapse of the USSR; there stood Albania teetering on the brink of a new direction. Students gathered in the center of the capital of Tirana in 1990 and others joined. They wanted a new life, a new direction, a new hope and they protested for it. And then Albania opened. The first declared atheistic state of the world opened its doors and emerged from the shadow of its ruthless dictator of 40 years, Enver Hoxha. In the mountain village, my team and I had already obtained permission from the local mayor of the town to set up in the central green area of the village. We talked with the villagers as we erected a simple double-sided screen. That evening we were showing the most translated movie of all-time, the Jesus Film. The night showing was in the Albanian language. My team of college students were hopeful to share with the people and stay in the village for the next week or longer, if possible. As the sun dropped behind the large mountains of the north, the time was getting nearer. All around me there was activity and excitement and many of the villagers were finishing their day in the fields and homes and joining around us. And then I heard some commotion. There appeared to be a heated debate. Raised voices, some yelling, and an argument was becoming the focal point there on the grass. One of my Albanian teammates came up to me and told me what was happening. The local Imam was having a vicious argument with the mayor. His threats were serious and although I had permission from the mayor earlier in the day to show the film, the mayor himself packed up his stuff, got on his cart and bid me and my team a generous farewell for the evening. His permission was thence revoked – in its place the next order of authority – the local Imam. When Albania opened, they opened fully, allowing all in – both Muslim and Christian alike. All evidence of religion was wiped away during the Hoxha atheistic rule. Thus, many a mosque and church were erected when the doors opened in this small European country. Like many places before on Earth that have been the battlegrounds of religious violence, ancient Illyria is no exception. This too was a place of contestation, a place where life was lost from shed blood – an ancient pagan peoples become Christian and then in the 15th Century a conquered people become Muslim. With so many years of religious experience, it was no small feat to transform the society in the mid-20th Century into an atheistic state, sending all remnants of religious adherence underground as buildings, monuments, and anything religious was destroyed. I was told that less than 6 Albania people in country were Christian when it opened. I don’t know if that is true but what is true is that the Albanian people were held back from actualizing their true potential all based on the notion of atheism through Communistic dictatorship for 40 years. The Imam approached me with zealousness in his eyes. His words were loud and they were directed at me. My Albanian team told me he was threatening my life and that if I showed the film, he was going to come back and shoot us with his shotgun. I protested. I said there was nothing to fear from this film and didn’t even his scriptures acknowledge Jesus? I had the permission of the mayor, even if withdrawn, and the village people were gathering, wanting to see the film. Why was he blocking it? The argument intensified and so did my passion. However, from the edge of the green there came another commotion. This time one of my teammates was involved. The Imam had already stormed away readying himself to realize his threat – no doubt if he failed to do what he said, his reputation would be lost. He must have felt we were a real threat to his leadership and way of life – I felt like we were allowing people to make up their own minds. I was determined to show the film and risk an encounter. The second commotion, I came to find out, was generated from another villager. The village man told my teammate it was true that the Imam would kill us and that just last week the nearest village on the next ridge stabbed a Dutch Christian missionary and stripped his clothes naked as they literally kicked and stoned him out of town. The village man reasoned for peace, for tolerance, and for our safety with all passion he could muster. He offered his protection and his hospitality. He offered his besa. The Albanian besa. What a beautiful thing. We agreed to go with the man offering his besa, but I didn’t know what it meant – my Albanian teammates did though. The man urged us away because, by giving his besa, he now was between us and the Imam – he was putting his life on the line for us, the strangers. We packed up our things, explained we were sad to not show the film that many had gathered to see, and said our farewells. I was pretty upset about the whole thing and my teammates prayed and helped me along as we walked from the green to the man’s house down the mountainside through narrow village streets. He explained he would take care of us. He explained, his home was our home. He said, anything we wanted he would get it for us. He even said he would ask many village men to stand watch all night long to protect us. And that is what he did. We met his family, talked about life, broke bread together and stayed safe all night long as he gave us all the comforts he could. It really was remarkable. He opened his home to us, complete strangers, with no strings attached. The Albanian besa. Was it just coincidence? Was it just a thing for this village? No, the besa is an Albanian tradition. It is their code to walk by honor and duty and hospitality. It is welcoming the stranger – it is the Albanian besa. A recent article by the BBC explains another encounter with the Albanian besa through eyes of the refugee exiles flooding into Albania and Macedonia during the Kosovo-Serbian conflict. I saw that flood and its aftermath first hand in 2001 when I went to Kosovo. The BBC article asks what can be learned from Albanian trust? I echo that same question for us as well, what can we learn from the Albanian besa that promotes peace instead of conflict? Albanian besa welcomes the stranger. Think about how you feel when you are welcomed. Being a person of welcome is already a step towards peace. What if we were so welcoming that we invited strangers in need to our home? Maybe an immigrant, maybe a person at church, maybe someone who just moved to your town from another, maybe the poor and downtrodden. These people are everywhere. They come into my country all the time. They stand on my corner with “Help!” written on cardboard signs daily. I was welcomed as the stranger in Albania. Thankfully the church is rallying, ever it be slowly, to welcome the stranger better. Ministries like the Welcome Network exist in many places that work to build coalitions with churches and others, along with events that raise the same kinds of welcoming questions are growing more frequent. Albanian besa puts others first. What a concept! In our world of ‘I got to have mine!’, putting others first is rarer and rarer. Increasingly we are a self-interested, narcissistic, me-first attitude people. I fight against this tendency internally every day. In my worldview as a Christ-follower, it is called sin. It shouldn’t be a surprise to Christians that our world bends in that direction. The fall of Satan was due to this attitude. The fall of mankind was through this attitude. I was really amazed that this man, not a religious man according to his own volition, would give his Albanian besa to me and my team and put us first. What if we all willingly put other first – wouldn’t that, even as hard as it is, promote peace? Albanian besa honors real community. Real community – whew how difficult to find! It has been said that it takes a village to raise children, but where are our villages? In the United States, they are all but disappearing. I hope where you live they are not. Do you know your neighbor? Do you let your kids run free in the neighborhood in which you live? What are your work relationships like? Do your co-workers ever come over to your home? Where is community in your life? I find community at home, at work, and at church. In Albania, I found the man who welcomed me was truly interested in conversation and interaction with me and my teammates. Community promotes interaction, it promotes accountability, and it promotes resolution. Community provides the grounds for conversation. And with conversation comes the potential for peace. So what can we learn from Albanian besa? A lot. I’ve tried to point out just three, but of course there is more. And why the emphasis toward peace? Because we need it. Where there is peace, there is life. We need peace in our lives. We need peace in our country. We need peace in our world. Ultimately, I found eternal peace in my relationship with God through Jesus Christ. But not everyone agrees with that and I am ok with that because I value others opinions and thoughts. I have friends from all walks of life and I pray for them. I don’t know how good I am at welcoming the stranger, putting others first, and promoting real community, but I hope to improve. In a sense I hope to engender more Albanian besa. In is natural that we won’t always agree with others and we won’t always think the same as others. But what if we welcomed the stranger, put others first, and worked to create real community? What would our world in 2050 look like if we did more of that? There are clear links between what I’ve drawn on between Albanian besa and what the Bible discusses on these topics. If you are interested, here are a few links in that direction. Author geolearnerPosted on September 22, 2016 November 28, 2016 Tags 2050, Albania, Christian, Community, earth, Jesus, peace, Stranger, tensionsLeave a comment on Entertaining Global Peace with Albanian Besa? Will our missionaries be prepared for this future? The discipline of Geography, one of the academic majors represented in the GEO Department at Calvin College, is a sort of rarity. There are only a handful of private Christian-based colleges in the United States that have a geography major, let alone any PhD trained geographers. At Calvin College we have fluctuated between 5 and 4 PhD geographers for the last 20 years and have been striving in geography to understand the intersections of geography and Christian faith. It is a wonder why so many Christian higher-education institutions, which have as mission to impact the world for Jesus Christ, have a paucity of geography? Beyond geography majors, we have a wide range of other majors taking geography courses at Calvin, not just future missionaries, but at its basic level, how can missionaries know where they are going, what the world is like in its human and physical geography, and understand the deep connections of time and space – without geography? Maybe it is time for Christian colleges in the United States to recognize the importance of this old academic discipline as part of the core fabric of who they are. Many in Geography have been thinking about the year 2050, such as with recent conferences by an older geographic body of thinkers, the National Geography Society. As I took my seat in the famous Low Memorial Library of Columbia University in New York City, the mighty pillars of marble stood tall against the backdrop of the stage. Around me were 250 other people from various walks of leadership: the Vice President of Google, the director of the National Geospatial Intelligence Agency of the United States, the Vice President of Shell Oil, the Geographer of the United States in the US State Department – the list goes on. We were at the Geo2050 conference sponsored by the American Geographical Society, which brought together experts from around the globe in November 2014. Our task at Geo2050 was to converse broadly about the current state of the world from environment to energy to society to technology. Together, we considered what the world will be like at the mid-point of the 21st Century. The challenges we face are significant, and both hopeful and dire possible futures were discussed. Although the Low Library has etched in the exterior limestone, “For the advancement of the common good and the glory of the Almighty God”, conversation about faith in God was absent from the agenda this year. I could not help but think, as a Christian who happens to be a geographer, about the ramifications for the American Church moving toward 2050. So what about the Gospel and discipleship over the next 35 years? What should we as Christian leaders consider? The interconnected relationships of humans and the environment are vast and complicated. I explore these connections with students every semester. Whatever your opinions of the issue, it is clear that humans are placing mounting stresses on the environment (natural resource depletion, loss of habitats and species, earth heating, ice melt, etc…), The key to thinking about the future of making disciples for Christ is really based on one simple question – where will people be? The vast majority (7 in 10) of the 9.5 billion people will live in urban places. That second point is vitally important. For the first time in history, more people are living in cities than in rural areas. The crossover to an urban world happened in 2008, and there is no return to a rural world in sight. Our conversations about the future of ministry should have a significant urban focus. Why? First and foremost, because that is what Jesus did. Jesus went to the people and met them where they were. You know that too. Any church that wants to thrive in ministry not only opens its doors, but it goes to the people in the community and ministers with real dialogue seasoned with the life-changing Gospel. Where will the people be? They will be in the city. And that is where we should be too. Are we ready to train the next generation of Christian leaders to understand ministry in the city? In 2050, we will be sending our missionaries to the urban cores of high population density, especially in the developing world where urban growth is currently unprecedented. Will we empower missionaries going to these uncharted urban mazes? Will we train them for the significant challenges they will face with the poor that are flocking to developing cities forming new squatter settlements every day? And what about children? There are 200+ million orphans in the world, according to the latest UNICEF estimates. We need to prepare missionaries well, because the poor and orphans will increase in this urban growth movement. What will urban growth be like in the next 35 years? Right now the most urban growth is in the developing world. The UN and geographical research estimates that the Earth in 2050 will host in excess of 1,000 cities with more than a million people predominantly in Asia and Africa. China leads the way with well over 160 cities of a million or more. In 2050, India will be our most populous country with the largest urban population on the planet. The absorption of cities into megacities or mega-urban corridors will be the norm, with at least 40 megacities with 10 million people or more. The cities with the most expected growth are outpacing their ability to provide for basic services of water and energy and sanitation. What about urban growth in the developed world? The growth rate is much slower at present. However, demands on energy, shifts in natural resources, consolidated ownership of fertile agricultural land and immigration all point to a continued move of people to the city. Edge cities, con-urban landscapes where cities meet cities, and new forms of built environments will be where most people live. What are some ways we as the church can adapt to this urban future? First, look for new opportunities in your city as it grows and changes. Where are the new places for ministry as change occurs? For example, in my city of Grand Rapids, Michigan, we have many new apartment buildings and condominium towers going up in the downtown. Are existing churches in the downtown changing the way they approach ministry with the influx of new pedestrian-based residents now living there? Are they adapting to the vast opportunities to minister to immigrants coming to the urban sector, and what does that look like? As we get better at these urban ministry approaches, will that translate to empowering our missionaries overseas? Second, where are opportunities for church-planting? How can the suburban/exurban churches partner with the urban churches in ministry? My suburban church is trying that with an urban church partnership. It isn’t easy, but God is doing some wonderful things. Will we lead new initiatives in these kinds of partnerships? Third, remember that cities are different and filled with people who are different, so ministry might not look the same from one city to another, and that is alright. You probably know your neighborhood pretty well, but if you do not know some of the basic demographics for your area, you should investigate at least the census details as a start. The American Community Survey (ACS), conducted annually in the USA, is another good way to learn sample statistics about your geography. Perhaps a church and non-profit partnership can lead to a county-wide congregational study that will reveal ministry opportunities in your city? If you live outside the United States, you can check with your central statistics agency as a starting point for demographics. If you live in the USA, you can check out this mapping application I built to start to learn about your area – Understanding Your Geography (http://calvin.maps.arcgis.com/apps/OnePane/basicviewer/index.html?appid=c069ce1274744b4898033ab2bfde3d9c). As a model for regional congregational studies, you can check out the 2007 Kent County Congregational Study, documented by the “Gatherings of Hope” report (http://www.calvin.edu/weblogs/csr/more/kccs_canvassing_completed/). During the triumphal entry, we find an interesting, often overlooked, response from Jesus. After the many praises of Hosanna, Holy Scripture indicates, “When He approached Jerusalem, He saw the city and wept over it,…”( Luke 19:41 NASB). Do we have the same compassion for the people of our city and cities around the world? Author geolearnerPosted on September 7, 2016 November 28, 2016 Tags 2050, Christian, GEO2050, Geography, Higher Education, MissionLeave a comment on Whither Geographically-Informed Christian Missions? Based on past and current patterns, researchers show what could be a possible future. Is that the future then? The half-way point of the 21st Century has become the newest marker toward projection of what the world will be like. Global and local models are made that try to indicate and predict over the course of the next 35 years, what kinds of environmental and human challenges can we expect if current trends continue. Based on past and current patterns, researchers show what could be a possible future. Is that the future then? No, not necessarily. However, analysis of existing trajectories can help us make smarter and more informed decisions as we consider conservation, stewardship, and proactive measures on Earth. How is the world changing and how can we understand what the world potentially will look like in 2050 and beyond? What are the deepest geo-related concerns and how can we began to formulate ideas and innovation that counter trends that are unsustainable? These are the types of questions that we hope to consider and reflect on with you in the current foci of the blog. We welcome your participation. So what are some of the top areas of concern that geo-experts and others are working toward deeper understanding? There are many ways to set this context and I want to build a template for what kinds of topics we might engage with over the next academic year with this blog theme. Not all blog posts will be about 2050 but most will discuss change and give deeper reflection on these themes I’ve outlined below. These themes are interrelated and sometimes dependent on each other and although they present challenges to consider and they are not exhaustive. Population growth between 2016 & 2050 will be most dramatic in developing countries and primarily situated on the Asian and African continents. Water. We need water to live and with the population pressures (numbers of people) and the location of those people (mostly urban), we face a challenge to have adequate clean water. Sanitation systems that use water are inadequate to handle human waste in many parts of the world currently. Food. As a vital resource, food security remains a top concern. Larger populations mean larger needs for food. Applied pesticides entering into soil and water systems pose significant health issues for our bodies. Land-use. With challenges toward 2050 the manner in which we treat our lands and environments will matter even more. Trees and forest are continuing to decline and prediction of tree canopy loss are larger than gains. Renewable energy gains could provide demand from large populations questions about adaptability and cost for developing countries will remain a key issue. Cryosphere. The frozen waters present on earth are currently challenged. Geopolitical fall out with a newly accessible Artic Ocean could increase tensions on rights of access and control at the north pole. Climate. The challenges linked to shifts in global climate pose significant challenges towards 2050. Shifts in flora and fauna that are unable to adapt to change give way to loss of biodiversity and new trajectories for disease. With the rise of religiously motivated terrorism has come questions about religions role toward peace instead of conflict. Technology. The benefits of technology continue to drive exciting innovation but at what costs? Ways of life with dependence on robotics, smart cars, and wearable virtual realities for everyday living, although intriguing, leave new ethically and legal questions that might be outpaced and in use before thoughtful discussion and implementation. The Poor. Will we rise higher and support the poorest peoples and countries as they are impacted the most by the challenges? Aged population remain in continual in concern as the prediction of mental health and Alzheimer’s is sky-rocketing. Biodiversity. Human populations, shifts in climate, and over tapping resources are driving forces towards larger and more devastating extinction. Urbanization. If 7 out of 10 humans will live in cities will urban environment promote healthy living? Adequate and affordable housing for growing urban sectors remains a constant challenge. Of course there are many more important challenges before us and these set the context for much of our discussion. In the coming weeks and months, we hope to discuss a variety of topics to bring deeper reflection on these and other kinds of issues. Using a quote from one of our participants from our Facebook page, Dan Riemersma mentioned, “I think, in a way, that I have always desired a GEO dept blog that uses a geographical voice to speak to the deep needs of the world, whether now or in the future. That’s what I really enjoyed as a student, and hope many more can learn too from this blog. With the context set of a world moving toward 2050, we invite you to join us as we reflect deeper. We’ve started a new blogging initiative in the GEO Department with the beginning of the autumn term 2016 at Calvin College. That is to begin thinking about 2050. We plan want to explore these projections and to consider them in light of our school mission, to think deeply, to act justly, and to live wholeheartedly as we engage in the world as Christians. Why blogging? As faculty in the classroom, we engage with our students about living between tensions. Often our ideal (hopes, dreams, desires for it and its people) of a specific geography is in tension with the reality (challenges, dangerous trajectories, injustice in it). As educators, we aim toward transformation and innovation through discovery. This blog will be about living in those tensions along a variety of topics that intersect the disciplines of geology, geography, and environmental studies. It is clear with present trajectories of year 2050 that our tensions might be great indeed. We hope you will join us and build this learning community.